I’m so thankful this weekend was basically non-stop full of action so the wait for GTA V went super fast. Now we have the NFL today, and a few Belaltor highlights from Friday. Sound good? Yeah, I think so too. 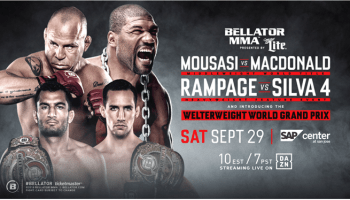 The featherweight tournament featured at Bellator 99 was capped off by a great win by who many think is the true featherweight champ, Patricio Freire. The featherweight tournament winner knocked out WEC and UFC vet Diego Nunes in just 79 seconds.